Some columns are easier to write than others. This is not one of them. Since April 1, 1985, the Drum Corps International office has been blessed with the presence of one of my favorite people, Peggy Kosin. Today is Peggy's last day at the office after 18 1/2 years of service to DCI. She is about to enjoy a well-earned retirement. But as DCI's executive director states, "Peggy is retiring from employment, not from DCI." We'll still be seeing her as a volunteer at major events. 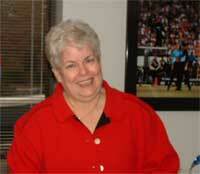 Many of you know of Peggy as the "voice" of DCI on the phone system. She's the one who has answered all inquiries that went into the office not directed to a specific person. Her soothing voice could put at ease the most disgruntled or confused fan. At the risk of sounding melodramatic, this is how soothing I find her voice. My dad entered the hospital in April for a bad fall in which he landed on his head, with seemingly little hope for recovery. He was so hopped up on painkillers that he barely knew who I was, and barely knew whom he was. When I hit a point of total despair at his bedside, there was only one person I could think of to call to try to cheer myself up. It was Peggy, sitting behind her desk. Somehow just hearing her voice gave me hope. (Dad has totally recovered, by the way ... almost like Peggy said he would.) Phantom Regiment director Pat Seidling picked up on the same theme, stating, "Her cheery, easygoing and down-to-earth nature sure made my life easier every time I did call or visit the DCI office. I am 100 percent certain I will miss her." Jeff Fiedler, director of the Cavaliers, seconds Pat's thoughts. "Peggy has always been the voice of calm, as well as the voice of reason when anything got crazy with a summer, the office or an order. Her experience will be missed and her friendly manner of greeting everyone is a standard by which we can all learn!" Capital Regiment's director, Rick Bays, adds, "Peggy has always been a wonderful person to speak to when I have called. She's always welcoming, warm and genuinely interested in my call(s) and questions. Having Peggy step aside is not only a loss for DCI, but all corps who have had the pleasure of working and interacting with her." George Hopkins, director of the Cadets, picks up on the thought that Peggy's day-to-day presence will be missed. "It is fascinating, amazing and fabulous that any one person could stay within the DCI office for so many years. Different bosses, hundreds of directors, and a changing staff from year to year ... and yet, Peggy stayed as the glue that bound us together. "Peggy made sure I received passes and tickets when I forgot to do w hat I was supposed to do. She assisted me with the Hall of Fame when I was the chair. She helped with the rules manuals registrations ... and on and on and on. "In the world of non-profits, people work to live the life of service. Peggy is a model to us all. She will be missed. She will most definitely be missed!" Apparently, many directors will miss Peggy. Dave Gibbs, director of Blue Devils, states, "Peggy has been a constant for me at the DCI office. Through all the years and change of staff, different buildings, and board of directors turnover, she has been someone I could ALWAYS count on to be in a good mood, to smile, be friendly and be able to answer ANY question. She has been the rock of the activity and goes beyond the call of duty to make a difference for the young people past and present. She has helped me from my first days of being a director through today. I will miss her very much and wish her ALL THE BEST!" Peggy means the world to a lot of people. It's kind of her "thing" to be comforting, to be the rock to which others cling, to put out brush fires at major Drum Corps International events, to make sure others are cared for. The following is an excerpted from the tribute to Peggy that executive director Dan Acheson wrote for DCI Today. "Peggy asked that there be no fanfare as she retired, but I thought you should know how special she has been to the activity. Peggy's work ethic, passion and overall sense of what needs to be done can never be replaced. She is THE EXAMPLE of what we all hope to be as a human being. She cares not only for the current year participants as if they were her own children; she cares for all of us who were once a kid in the activity. She is the epitome of what defines a gentle lady, but with a fire that flares originating from her Irish spirit with timeliness unmatched. We'll miss Peggy in her role within the DCI office but we look forward to celebrating many more seasons with Peggy the super volunteer." As a volunteer, she'll be traveling next season with her husband, Tom, who serves as the DCI major event scoring tabulator and maintains the scores on the DCI website. For several years, Peggy has had the added responsibility of taking on the operations of Friends of DCI and getting tickets for donors. In earlier years, she took care of all the tickets for each performance venue. Current ticket manager Kristy Holst says that Peggy would "do whatever is necessary to get the job done." Drum Corps World publisher Steve Vickers has many fond memories of Peggy. "For me, Peggy has been the go-to person for so many things over the years. I could always count on her either having the answer to my question, or knowing where to point me. Eighteen years is a long time to be at one job and especially with a non-profit organization. Her shoes are going to be very hard to fill, but I'm glad to know she isn't walking away from the activity. "I've know she and her husband, Tom, since they were involved with the Schaumburg Guardsmen back in the late 1970s. I value her friendship and wish her well as she now gets a chance to take it easy in her retirement." Personally, I doubt if Peggy will "take it easy" in retirement. She has grandchildren now and a couple weeks ago, she confided in me she was looking forward to officially spoiling them, which in itself could be a full-time job. Steve points out that Peggy started her drum corps life as a corps parent. They have four children, two girls who were guard members and two sons who were drummers. Husband Tom states that he and Peggy "have always been involved with whatever our kids were involved with, from Boy Scouts and Girl Scouts to high school athletics to drum corps. A neighbor got us started with the Guardsmen back in the middle 1970s. We ran the gamut of volunteer jobs from just helping out to her being chief cook and bottle washer on the road for a few years. "Our two daughters were also active in the Guardsmen Winter Guard, at the same time as were the daughters of (former DCI executive director) Don Pesceone and his wife, Mary. Their daughter Jill and our daughter Margaret became good friends. Through different functions for the guard, Mary and Peggy became friends. In early 1985, Mary offered Peggy a job in the DCI office. She took it and has been there since. "Margaret also marched with Jim Jones' Troopers and Gail Royer's Santa Clara Vanguard. Peggy was very selective about which corps she could march with. The treatment, nutrition, and overall well-being of the members were important considerations. "Peggy has been going in to work early, and coming home late all week trying to get everything 'right' (in her eyes) before she leaves. She is truly going to miss it. I'm sure she'll stay involved 'unofficially' for quite a while." We can all hope so. It seems fitting to include a tribute from a corps kid whose life was touched by Peggy. Carol Smith marched with the Guardsmen in 1981 and 1982 and was on the corps staff in 1986 and 1987, after marching with the 27th Lancers in 1983. She has marched with the Renegades senior corps since 2001. "How very cool that you're writing a tribute to one of my favorite people, Mom Kosin. That's what I -- and every member of the corps -- called her when I marched (with the) Guardsmen back in the '80s. Not only was she one of the support crew on tour with us, but I had the great fortune of living with her family in 1982 when my original housing fell through. "I have only deep affection for both Peggy and Tom for taking me into their home and making me a part of their family. They are two very warm, caring, funny people. "Hopefully DCI won't change the voice mail recording just yet ... I get a kick out of hearing her voice on it." Happy retirement, Peggy. May God bless you with the ability to truly enjoy your well-earned free time. Thank you for blessing us with your presence, your smile, your comforting words and your overall personality. You are one-of-a-kind and there will never be another you, as God surely broke the mold after you were created. And thank you from the entire activity. Michael Boo has been involved with drum and bugle corps since 1975, when he marched his first of three seasons with the Cavaliers.